Alpamayo was elected by many as the world's most beautiful mountain in the Scenic Photo Contest of Munich 1966. 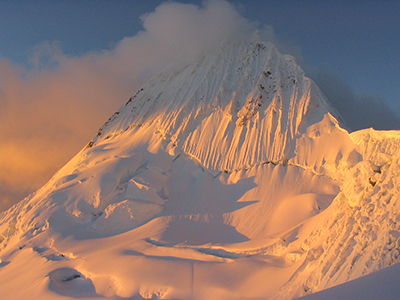 Alpamayo is one of the iconic mountains of the Cordillera Blanca, notable for the pyramidal shape of its incomparable southwest side, which hosts the world famous Ferrari route opened in 1975 by Italian climbers. We leave Huaraz in the morning and walk to our destination. We will see local peoples of the Huaylas alley as we reach the village of Cashapampa (2980m). 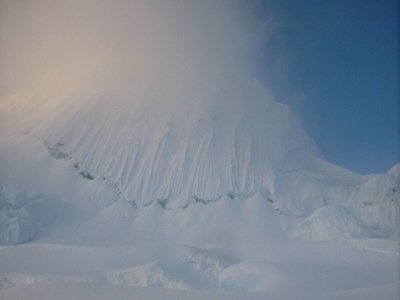 There we will start the trek and reach the first camp, called Llamacorral (3750m). On the second day we will start walk through the valley to enjoy the beautiful scenery and the lakes of Jatuncocha and Ichiccocha. We will continue following the path until we reach the base camp of Alpamayo. We ascend to the glacier of Alpamayo (5000m) where walk along the mountainside to reach the camp of Alpamayo (5400m), where we camp. This is the first night of camping on ice. We will start this day early (1-2am) to ascend and reach the base of the route Ferrari with an angle of approximately 75 degrees. Here we will begin to climb the wall to reach the top where upon arrival we will take photos of the most beautiful peaks in the Cordillera Blanca. We then rappel the route and descend to the camp. 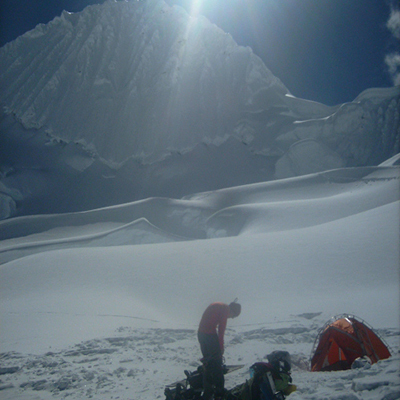 We take the same route from the day before, arriving at basecamp around 4300m where we camp overnight and recover. We return by the valley of Santa Cruz to the village of Cashapampa for our bus back to Huaraz.